To all of you who had fallen off the Final Destination bandwagon after the second installment, you're not alone. The idea of death coming back to haunt a few lucky teens who are the sole survivors of a disaster grew tired after the second time we saw it. But the fifth revisit to the franchise--now in 3D--can boast more twists, an appeal to an older audience and an edgy ending you least expect. On their way to a company retreat for a weekend, a group of twenty-somethings meet their demise in true catastrophic--not to mention gory--form on a faulty bridge in Final Destination 5. Well, at least in Sam Lawton's (Nicholas D'Agosto) vision they do. He's able to warn the other passengers, including his (ex?) girlfriend Molly (Emma Bell), and prevent their deaths. But, in true Final Destination form, they're not able to sideswipe the force that is Death in the long run. It comes after them one by one in the exact order of their proposed deaths on the bridge, in one freakishly wild accident after the next. Besides killing off young professionals rather than unsuspecting high-schoolers, the new movie doesn't entirely reinvent the wheel of the franchise. But the 3D effect ups the ante on the gore factor, while also creating an even more tense scene. Your fear is rattled at each impending death because you know it's coming, but you don't know how. In other words, your heart rate is jacked. That's how you know you're watching a pretty stressful scary movie. The funny thing is, there's no psychotic killers or demonic figures (unless you count Tony Todd's always effective performance as Bludworth) in Final Destination. The very thought of a simple trip to the eye doctor, or a visit to your acupuncturist can actually be a fatal visit is a frightening enough thought. If you liked the first Final Destination film, you'll go gaga over this new movie, which has a nice ode to the original in its amazingly scripted ending. Final Destination 5 won't be known for any stellar performances, but first-time feature director Steven Qualye can rest assured he scared the daylights out his audiences. Even star P.J. Byrne (who played Isaac) admitted he had to decompress between takes. Catch his full interview on today's Cinema in Noir below (it's about midway through the podcast). I cant believe this franchise has got to a fifth instalment, but it seems similar to The last Fast & Furious instalment it has gone back to its roots, which is nice to see. 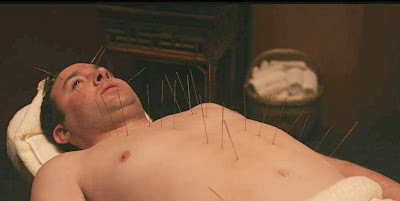 The death by Lasik and death by acupuncture look absolutely terrifying! The producers have brought the franchise back to basics with more gruesome deaths and a twist that will have the audience wanting more from the series. However, as fun as the death scenes are, everything else feels tedious and cheesy. Good Review Candice!